Grew up… in rural Oregon. Dottie has never been fussy, as she’s spent most of her life in the great outdoors. As a farmer, she isn’t afraid of getting a bit dirty. Living… alone on her family farm while she waits for her husband, Bob, to come back from World War II in Europe. Dottie is facing uncertain times as she awaits news of her husband’s situation. Profession… baseball player. 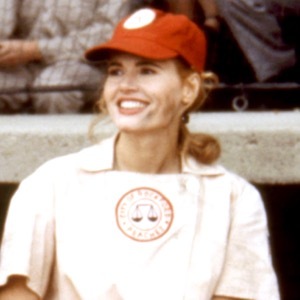 Professional scout Ernie Capadino saw a lot of potential in Dottie, a catcher, and offered her a job in the new All-American Girls Professional Baseball League (AAGPBL), which was formed because so many young American men were overseas fighting the war. Challenge… managing the team – and its manager. 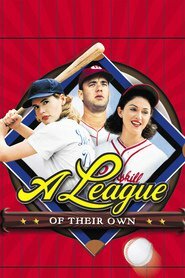 Dottie finds herself taking responsibility for her team, the Rockford Peaches, while the real manager, Jimmy Dugan, spends his time in a drunken stupor. Dottie puts up with senseless abuse from the sad and bitter Jimmy, and often has to cheer up her fellow teammates after one of his nasty rants. But Dottie slowly seems to be getting through to Jimmy, a former big league slugger, and he might just rise to the occasion. Plus Dottie must deal with her headstrong younger sister Kit, a pitcher who has followed her to the Peaches but chafes at living in Dottie's imposing shadow. Personality… strong and independent, yet fiercely loyal. Dottie is the only one on the team who steps up to take responsibility when Jimmy is indisposed. She’s a born leader, and talented to boot. Dottie Hinson's popularity ranking on CharacTour is #2070 out of 5,000+ characters. See our top-ranked characters and read their profiles.